DISCLAIMER: Don't steal my pictures, but if you must, contact me for permission before doing so. John Curry has done a lot for the Wilkes-Barre/Scranton Penguins. He took the team to the 2008 Calder Cup Finals as a rookie. He has re-written the Penguins history books; setting a record for goaltending wins with 33 wins in the 2008-2009 season. Not to mention how he has benefited Pittsburgh; traveling to Sweden at the start of last season with the team and even earning his first NHL win in November 2008; as well as a call-up in January due to injury to Marc-Andre Fleury. Curry has accomplished a lot in his short professional career, yet many WBS and Pittsburgh fans have forgotten it all in favor of Brad Thiessen. 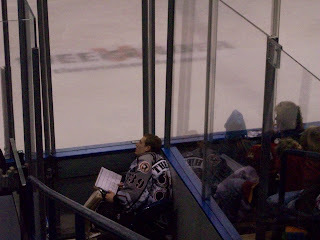 Thiessen is a rookie who started the season in Wilkes-Barre then returned to the Wheeling Nailers for some playing time. He is now back in Wilkes-Barre after being called up again in January when Curry was recalled to Pittsburgh. Thiessen’s record this year is 7-11-1 with a 2.74 goals against average and a .903 save percentage. He was in goal during a 5-0 shutout of the Hershey Bears back on February 13th. He was also between the pipes for most of the Penguins’ six game winning streak back in February. What the Thiessen supporters forget, or don’t notice; is that he is also making mistakes and showing that he is not ready to be a top goalie. 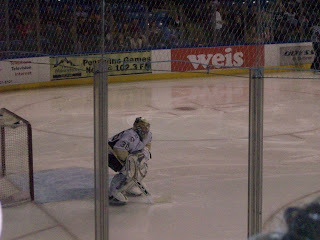 He has been in goal for a 7-2 loss against Hershey, a 3-0 loss to Binghamton, and still has an overall losing record. He has also cost us at least one game in the shootout (2-1 loss to Hershey on February 28th). Curry is certainly slumping this season, but still carries an overall winning record (22-17-2 with a 2.78 GAA and a .905 save percentage). He has been 4-2-1 since returning from Pittsburgh during the Olympic break. Further, he is extremely clutch in the shootouts; going 10-6 in them during his career. For a goalie that has been struggling, that is not a shameful record. It shows brighter days are ahead for him. So why act like he doesn’t deserve another chance for the rest of his time as a Penguin? Even though Curry is showing signs of breaking out of his slump, he is still not getting support. I think that’s pretty unfair. If improving his record and showing that he feels bad about the way he is playing isn’t enough to redeem him in the eyes of the majority of the fanbase, then what is? Should he have gotten four shutouts? The fans should consider that Ray Shero, whose opinion trumps all of ours, has not given up on Curry. If he had, he would’ve found a way to send him away at the deadline. We all know Shero is one of the brightest general managers in the NHL today so I don’t doubt he’d find a way to package a player who is not a benefit to the organization. If the Penguins were to make the playoffs today and face Hershey in the first round tomorrow, I would want Curry to be the Penguins’ goalie. He would’ve likely carried the team through last season’s playoffs had he not been injured during the Bridgeport series. Not only that, he knows what it takes to get to the Finals. Aside from the Calder Cup Finals in 2008, he was a part of Pittsburgh’s taxi squad during the Stanley Cup playoffs. You can argue that Thiessen was too (but Thiessen was not on the official roster), but Curry has spent more time around Marc-Andre Fleury; who definitely has what it takes to win a big game. I have no doubt Curry would rise to the occasion. I do not think Thiessen can be a number one goalie right now. This is not only because he has bad games, but because he has not accomplished what Curry has so far. You can argue that he is a rookie, but when Curry was a rookie; he was recognized as an AHL Rookie of the Month (December 2007) and was named to the all-rookie team at the end of the season. Thiessen has yet to accomplish these things. He also needs to win a playoff series. A few good games does not, and should not, make him the goalie of WBS’ immediate future. Right now, the fanbase is favoring a goalie that may have the same struggles in a year or two that Curry has now. Longtime fans know what he is capable of accomplishing. We should stand behind him and believe he can break out of his slump as much as the coaching and management staff believes he can. Taking his number one spot away from him would hurt his confidence even more and it would be difficult from him to find some momentum. I’ll leave you with this: Can you say that with the season on the line, that you would rather have Thiessen in net? If the Penguins were on the verge of their first Calder Cup, would you want Thiessen to make sure we won it? Asking him to do so would be like asking Brent Johnson to start in the Stanley Cup Finals if the Pittsburgh Penguins go back a third year in a row (I am not putting down Johnson, but think about how wrong that sounds). Think about your answers to those questions, and then decide who you want minding the pipes in WBS for the remainder of the season and possibly playoffs. I know what decision I would make if I were Todd Reirden. What about you?